It seems we have a tradition started. Living in an apartment doesn’t give Kristen and the kids much room, or a place, for pumpkins. Last year, she and the kids brought their pumpkins here and carved them. Yesterday, we repeated that event. They picked up their pumpkins from a local grower and brought them over here for carving while I was finishing up another batch of soap. A fun and productive afternoon was had by all. I can honestly say I’m, happy it’s the weekend. It has been quite the week. There are always the usual things… work’s still busy, busy, busy; will it ever slow down enough that we have the opportunity to catch up? Then, on Tuesday, I got a call from Kristen. Ethan was in a lot of pain and she wanted to know if she should take him to emergency. I went over, took one look at him and told her to go. He’d broken his arm while playing at a friend’s house – boys being boys! That meant an evening of back and forth between the hospital, Kristen’s and my place. Trinity ended up staying the night here. At the same time, we had company. John’s boss had been here for 10 days and would be leaving early Wednesday morning. Ethan ended up being discharged late Tuesday but had to go back in on Wednesday morning to have his arm surgically set. They anesthetized him, set the arm, and put a temporary cast on. There was a chance that they would have to install pins to set the arm but everything went well and no pins were required… thankfully. Once the swelling goes down, some time next week (eta: Monday), he’ll go back to the hospital for a regular cast. In the meantime, we’re all watching him to make sure he doesn’t trip or bump into anything. It’s times like this that you really want to put your child in a bubble so that nothing more can ever hurt them. Then, on Thursday night, I ended up with a couple of cuts to my right hand when I put my wine glass down a little too forcefully. It shattered, slicing my ring finger and my pointer finger. By Friday morning, the stress and tension of the week decided to center itself in my head and I woke up with a killer headache. Needless to say, I stayed home and did a whole lot of nothing! Yes, I’m feeling a lot better now, thank you. Yesterday was a good day. I went out for lunch with a friend, did a bit of shopping (bought a couple of tops and visited my favourite art store) and even got creative. It feels like it’s been a long time. I think I found the link on Pinterest; I’m really not sure, to be honest. The file has been sitting on my desktop for a few weeks now, with the intention of making a few. I used to crochet a lot. I have numerous doilies and my mother has even more that I made for her. 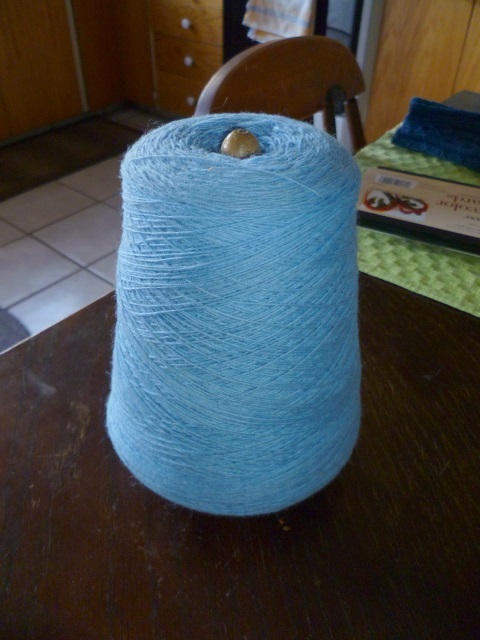 I went stash diving and came up with three or four yarns that would work. The pink is some ancient crochet cotton; I’m not even sure where I got it as it isn’t a colour I particularly like. The blue yarn is something I picked up a few years ago at the thrift store. I’ll be able to cover a LOT of rocks with that cone of yarn. To top it off, I have two cones of the stuff and I have no idea what I’ll ever do with it, besides crochet what John calls rock cozies. I also have some off white cotton (10 balls of it) that I can use. I was thinking of doing some yarn bombing of my own. 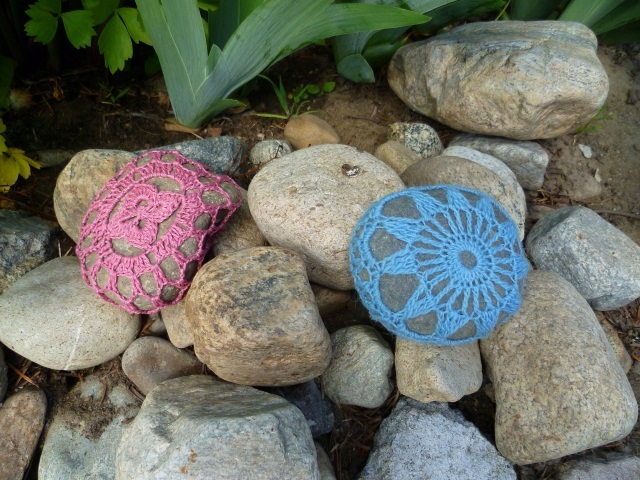 Can you picture walking along the creek and coming across crochet covered rocks here and there? I think it would be fun… and whimsical. For now, though, I’ve put them in the little pile of rocks at the edge of my flower garden. 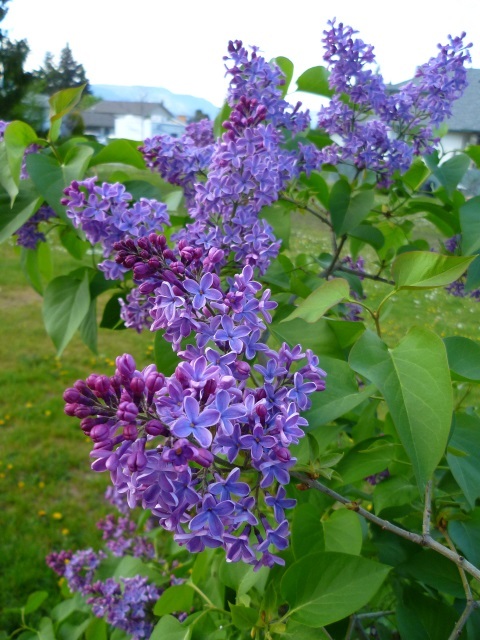 And, speaking of garden, this is what’s blooming in my garden at the moment. Wow! I can finally post about a finished project. It’s just a small one but it’s a finished project nonetheless. I’ll get to that in a moment. Last week was Thanksgiving here in Canada and John and I drove to Abbotsford to celebrate with my Mom, my kids, and my grandkids (all 7 of them!). John and I cooked the dinner at my daughter’s apartment and we got to enjoy some quality time with them. We stayed at my mother’s for the duration of our stay and one advantage to that is that I did have time to finish a book (The Girl Who Kicked the Hornet’s Nest, third in the Stieg Larsson trilogy) and time to work on a small knitting project. I’ve made a few pairs of wrist warmers for myself over the years because my right wrist gets quite cold and achy, even in the heat of summer. The last pair I made have seen a goodly amount of use and are, quite literally, falling apart. If I were to tug on the loose thread, they would come apart completely so it was definitely time to make myself another pair. I started them a couple of weeks ago but didn’t have a lot of time to work on them. 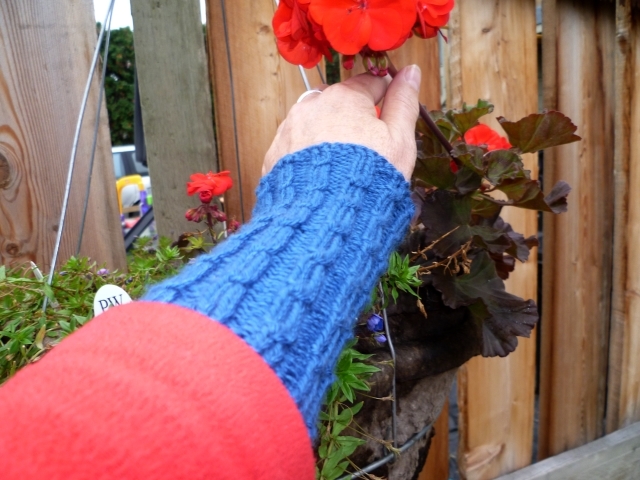 By the time we got to Mom’s, I was up to the cast off on the first wrist warmer; it wasn’t until last Thursday that I finally finished the cast off and immediately cast on for the second one. I finished it on Friday morning, well before I had to catch the bus at 1:30 p.m.
I’m pleased. They’re snug, they’re warm, and they’re not bad looking. I’m not sure what the yarn is, although I do know that it is 100% wool, and it’s a sport weight yarn. They were knit on 3.0 mm needles, making them nice and snug. 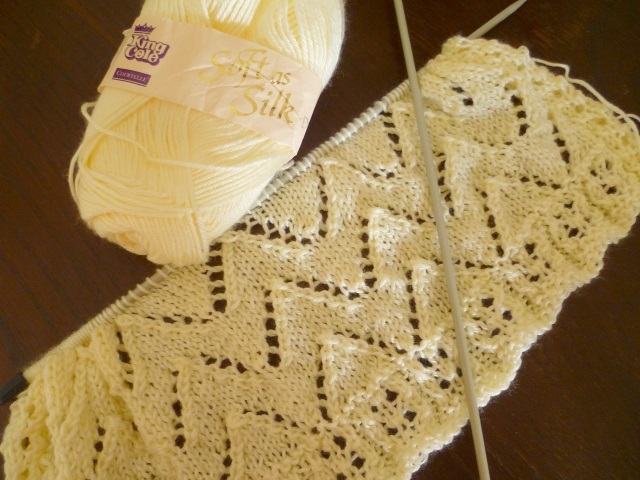 The pattern is an offset baby cable. Normally I would have done the baby cable every 4th row; on these, I started working every second column of knit stitches on the 4th row, then alternated on every 8th row. Does that make sense? 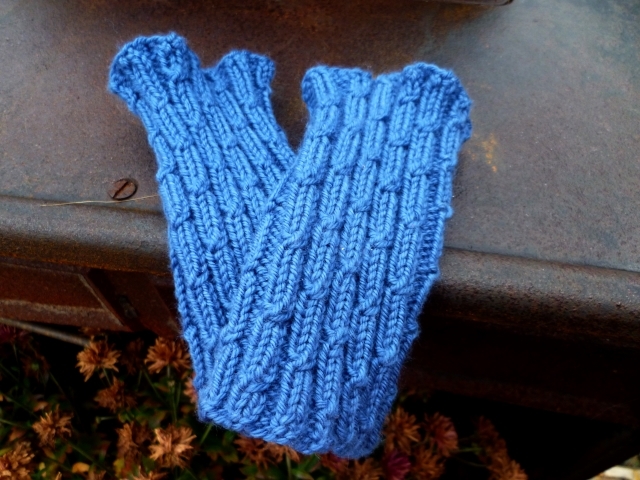 The total length of the wrist warmers is 5.5″. If there’s any interest, I’d be more than happy to write out the pattern (it will be the first in a long time!). 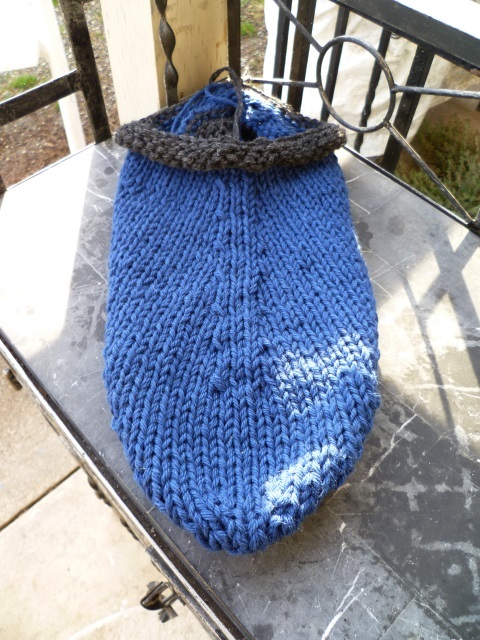 Now, I need to make a pair to go with my new winter jacket; it’s lime green and navy blue. I have a pattern in mind but I need to go stash diving to see if I have any yarn that will go with the jacket. Back to our visit with the kids… One of the things we did while we were there, one of the things John insisted we do, was to make grape jelly with, and for, the grandkids. Trinity was all ears and all eyes as she stood with me and helped while I ladled the hot jelly into the jars. Together, we made nine half pint jars of gorgeous grape jelly. Each of the grandkids was given a jar. The two remaining jars went to my mother and Kristen’s boyfriend. That was Monday. By Tuesday, the half jar that we left with Kristen was already finished. The jelly was a complete success and the kids were thrilled! 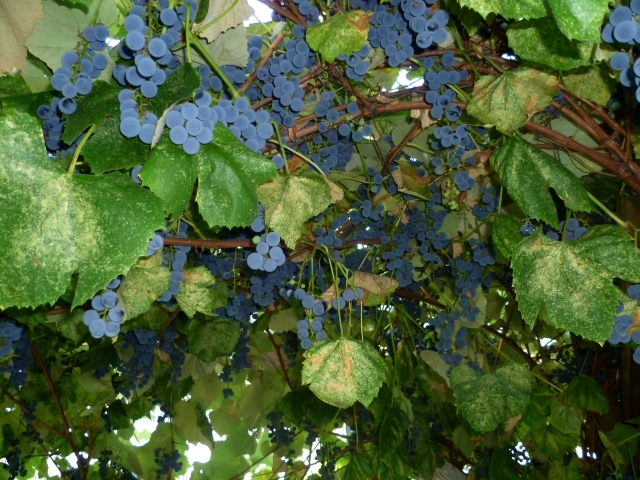 After John got home, he picked more grapes and later today, we’ll be making more jelly… for John. Personally, it’s very rare for me to eat toast with jam or jelly. It is, however, an enjoyable task making jams and jellies. It’s such a wonderful feeling seeing those jars of sparkling purple jelly. 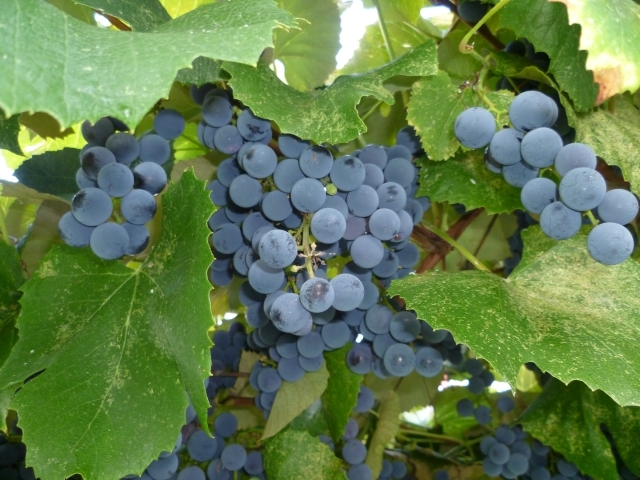 And, as you can see by the pictures, this was a good year for grapes. I’ve been nominated for a blog award. I’ve never heard of the Liebster award but I’m honoured nonetheless. It will take some thinking before I post my own nominations, answers to questions and my own questions for those bloggers I am to nominate. Keep your eyes open. In the meantime, more progress is being made on John’s sweater. I’m trying to work on it a little bit every day and, at this point, I have almost 11″ done on the front. I’ve been alternating between knitting Continental and English as both my wrists have been giving me some problems. I’m glad I can switch back and forth between the two techniques. Interestingly, I’m not noticing any difference in the tension between the two methods. I hate to say it but I seem to have a knack for keeping my tension pretty even (my mother has commented on that fact in the past; it used to drive her crazy as you can read her mood at any given time over the course of knitting a project by looking at her tension). The last couple of days have seen a bit of a welcome change in the weather around here. The nights have been cooler, with a couple of nights of temperatures around 8ºC (46.4ºF); I even put an extra blanket on my side of the bed! Yesterday, we had some much needed rain and today the sunshine is back. The temperature, though, is finally a little cooler than it has been (around 23ºC or 73ºF). It’s a lovely day, really. As a matter of fact, this is the kind of day I enjoy… not so hot that it makes cooking a torturous task but not so cool that you need to add a layer for warmth. Because it isn’t so hot, I’ve been busy in the kitchen most of the morning. 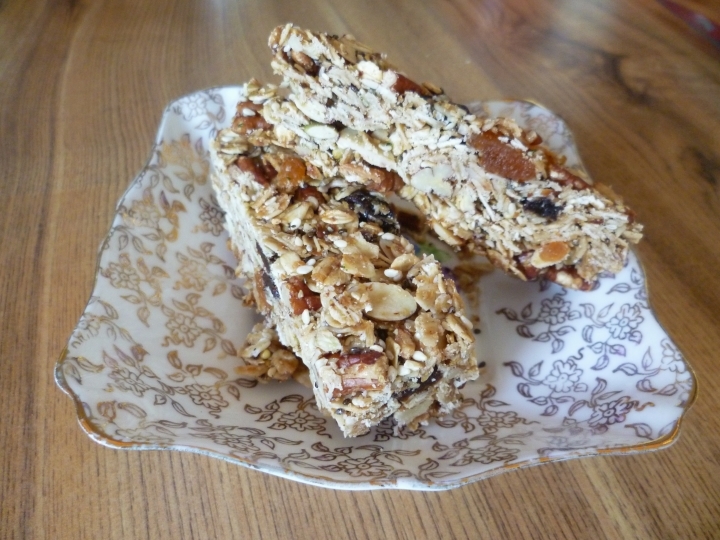 There is now a batch of homemade, very seedy and grainy, granola bars packed into a tin, ready for the coming week’s lunches; there’s a batch of homemade hummus in the fridge (a little too heavy on the tahini for John’s taste, though), and we’ve had a lovely big brunch that should last us until dinner (bacon, eggs, whole grain bread, and yogurt with fresh blueberries and peaches). And out in the garden, things are looking good. John’s been having some back problems this summer so we haven’t been out in the garden as much as we should but we have been eating from the garden almost daily for the last month. While I was outside today, hanging up a load of laundry, I was looking at my little herb garden and some of the potted plants. This is, quite literally, just outside our back door. The empty patch is where we had lettuce growing; it’s now finished. 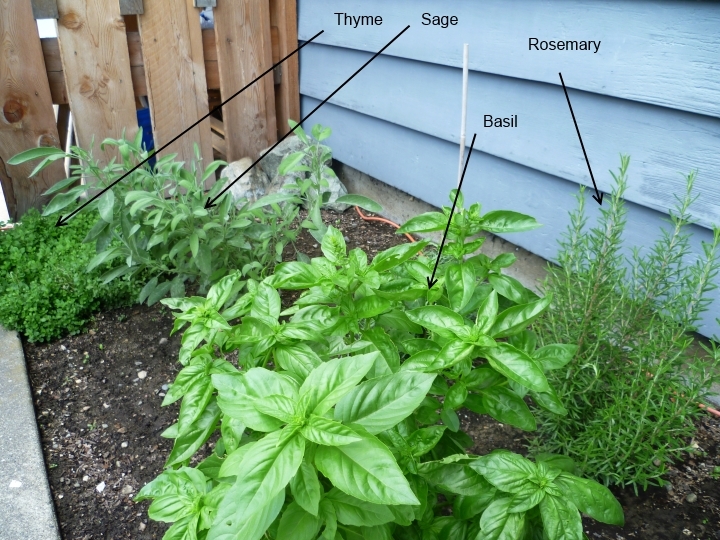 In addition to what you can see here, the stick just to the left of the word “Basil” indicates where the French Tarragon is. Lovely stuff! As well, to the right of the rosemary and the basil, there are two kinds of parsley, Italian and regular old ruffled parsley. 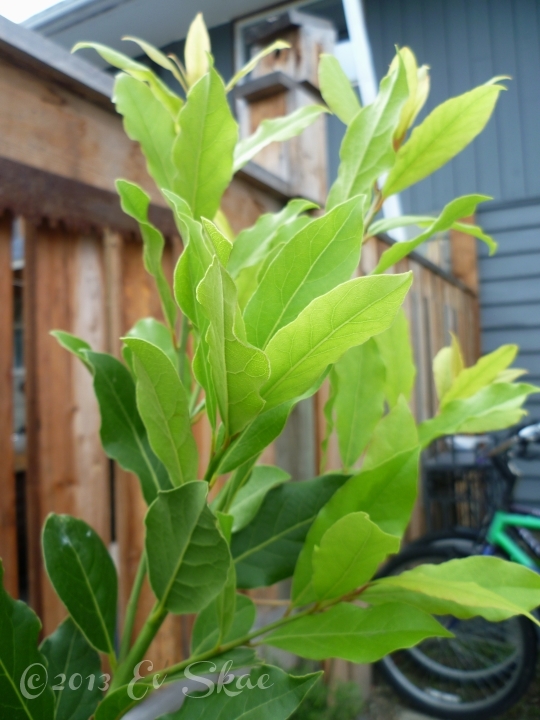 I was blown away by my bay tree today. It has put on a magnificent spurt of growth this summer. And, not only has it grown, it is about to bloom! All of the light green is new growth. Amazing! I’ll post pictures of the flowers once they bloom. I have to say, I’m really looking forward to seeing what they look like. I think this little tree is loving the weather this summer. Let me qualify that. 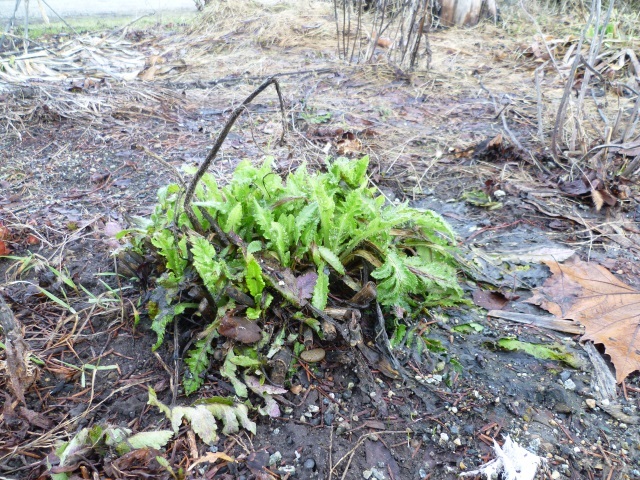 We have a mystery plant in our yard. It all started the first summer we were here. 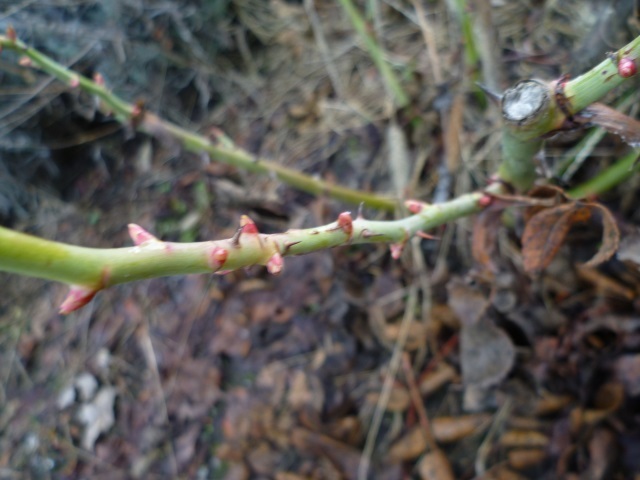 A twig next to one of the cedar trees produced leaves. No one knew exactly what it was so we all just watered it and let it grow. Each year, it has returned and each year, it is larger. This year, it’s about three feet tall and I want to know what it is. If it is what I’m beginning to think it is, I’m not disappointed. Any input? Oh, you want to know what I think it might be? 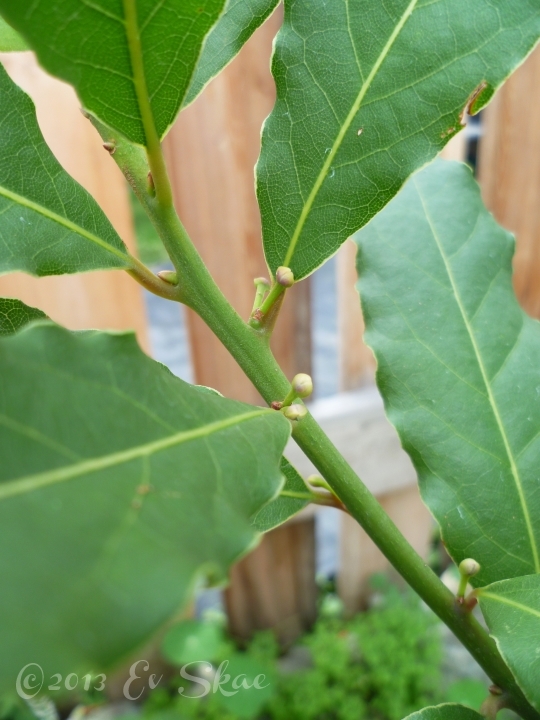 Well, after having consulted on a couple of different websites, I’m beginning to think it’s a Catalpa. Where it came from, I have no idea! 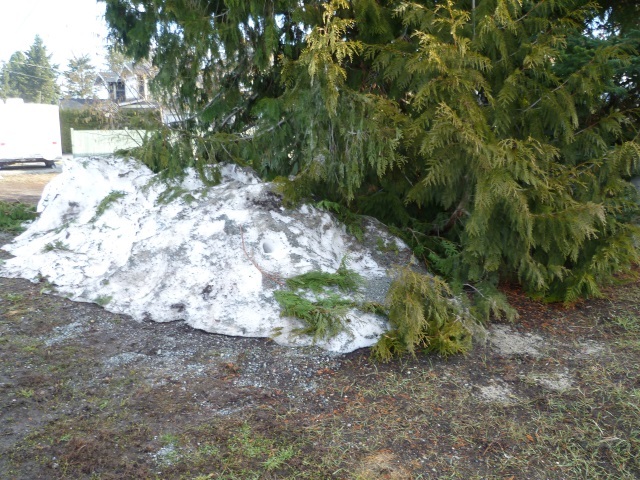 Quite literally, when we moved in here, it was a stick in the ground that was, perhaps, about 12″ tall. It has been an eventful couple of weeks, which is why there wasn’t much in the way of blogging. Last week, we had company and I find that when we have company, normal routines take a back seat. Now, however, it’s back to the normal routines of spring. Yard clean up and gardening has been the main activity around here. 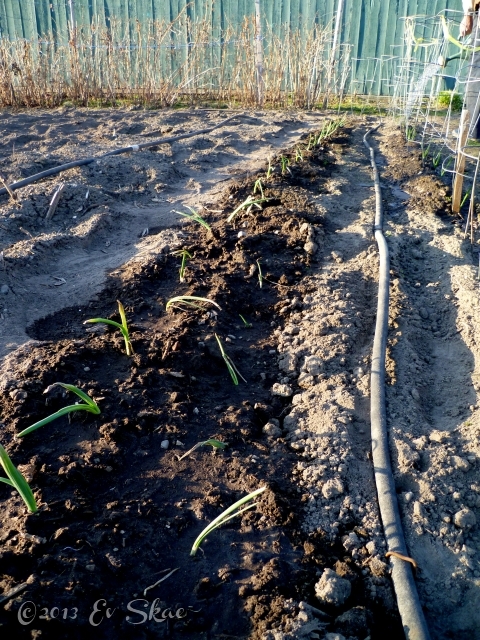 The Walla Walla onions are planted and thriving; the garlic is quite high now and the lettuce and basil are starting to grow in the back door garden. 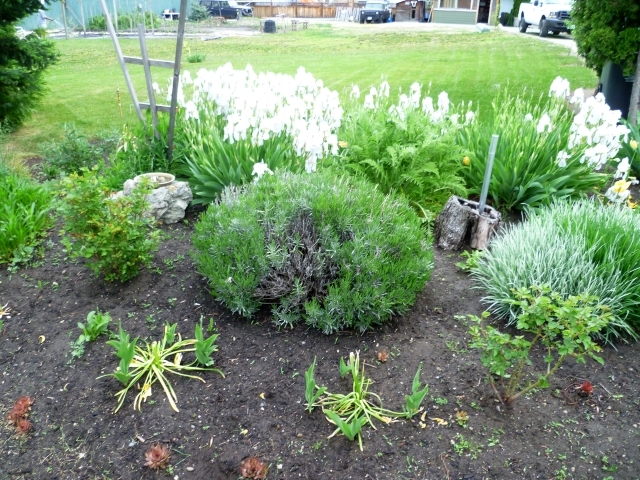 As well, in the front flower bed, the tulips are finishing and the white irises are in full bloom! John has some cherry tomato, jalapeno pepper, and cantaloupe seeds in starter pots and had beans and carrots planted. Yes, gardening season is in full swing around here and I must say that it feels good to see things growing and thriving. The past couple of weeks it’s been absolutely gorgeous, hot and sunny with temperatures hovering around 30ºC (mid 80’s F) so you can well imagine why the garden has been doing so well. However, it’s cooling down today, with the threat of rain. That’s ok, with all the sunshine we’ve been having, we need some rain, too. 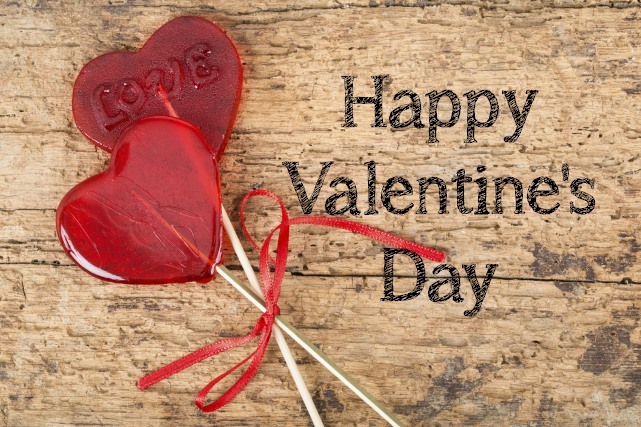 It isn’t often that I post about family matters on my blog but this week I’m going to. If you pray, I would ask you to pray for my nephew. He is a public health nurse in Los Angeles, is married, has 5 children under the age of 10. He was recently diagnosed with acute lymphoblastic leukemia (ALL) and is currently undergoing chemotherapy there. 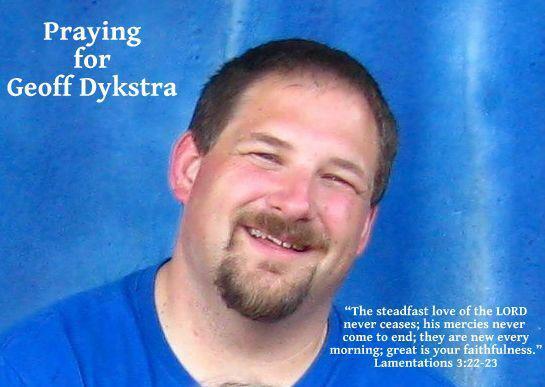 He seems to be responding well to the treatment but he and his family can use all the prayer support he can get. Today has been a strange day. It felt as if I’d done nothing at all, really, but when I stop to look back on the day, I realize that I’d actually done a fair bit more than I’d thought. First thing this morning, I made the chocolate chip cookies I wanted to bake yesterday but didn’t get around to. No pictures. Sorry. Didn’t think about the camera. Trust me, they’re good! I used my new cookie sheets, which I absolutely love! I took a bag of frozen, shredded zucchini out of the freezer and made a batch of zucchini soup. I’ve posted the recipe before. If you’re interested, you can find it here. I can heartily recommend this soup; it has never failed to please and can be eaten hot or cold. Then, this afternoon, I decided to try some gluten free baking, thanks to my daughter. I made whole grain gluten free muffins and, once again, they were really good! I blogged about them here. See all those dark spots? That’s where we planted tulip bulbs. 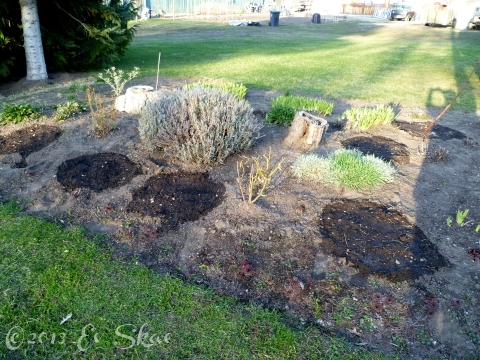 And John planted stuff in the garden, too. 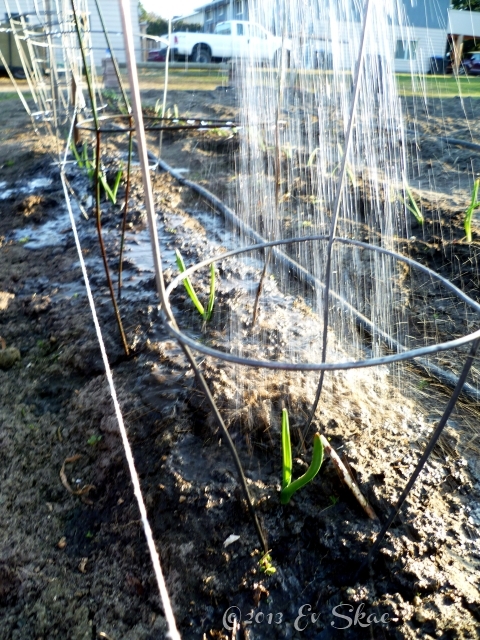 The garlic is coming up beautifully! I’m so pleased! Hopefully, we’ll get slightly larger heads of garlic than we did last year but even if we don’t, it’s so rewarding to see that it’s growing so well already. 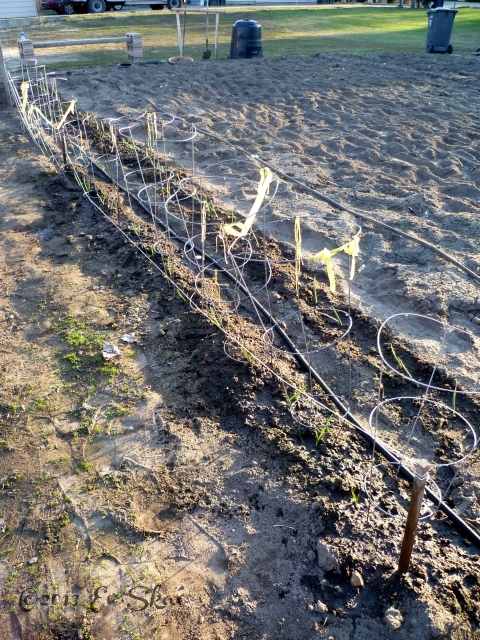 John also planted the Walla Walla onions we picked up yesterday. He’s also planted some peas, with some sweet peas (the flower variety) mixed in. It’s definitely spring around here! My sympathies to those of you who are still dealing with winter. It felt good to make a little progress on the Lowtide Cardi this week. I’d like to have made more, but I did have to wait for the blocked pieces to dry. Now that they’re dry, I’m hoping to make some serious progress this weekend. The first photo shows all three of the bodice pieces and the second shows the back bodice. The next step is to join the garter stitch shoulder “seams” and then to pick up stitches all along the lower edge. Extra stitches are cast on at the underarms and the body of the cardigan is knit down until the desired length. Picking up all those hundreds of stitches will be the fun part… not! 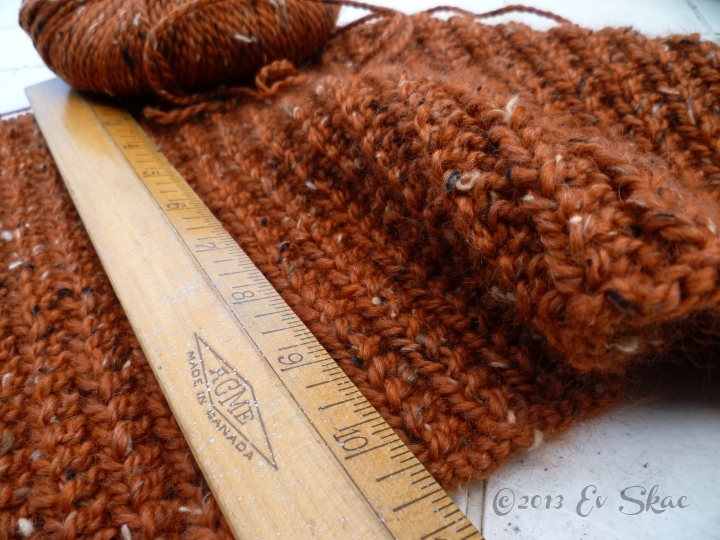 Once the body of the sweater is done, the live stitches are picked up at the armholes with more picked up at the underarm; the sleeves are then worked downward to the desired length as well. That’s one of the nice things about this little cardi. You can make the sleeves, and the body, as long or as short as you wish and, I must admit, I haven’t quite decided what length I’d like the sleeves. 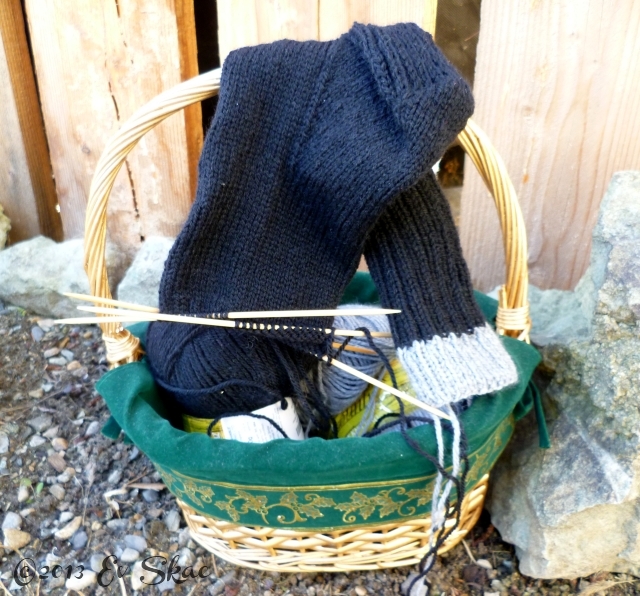 Then, as I’ve said before, I’ve decided to keep a pair of socks on the needles for TV knitting and, simply, because John can use all the socks I can make him (I might have to cast on a pair for myself, too… mine are all starting to wear at the heels). I showed you the pair currently on the needles in the last post; it’s seen some progress as well. I’m almost to the toe shaping on the first sock but I want John to try it on first; I’m a little concerned that the foot might be a bit too wide. I’m not terribly concerned but I do want to be sure it will fit properly. Once I’ve been reassured, it will be full steam ahead and the second sock will be cast on shortly after this one comes off the needles. What’s the weather doing in your neck of the woods? Here, it’s a gorgeous sunny day and it has revealed some very grungy looking windows. I’ll be taking care of that little issue in a few minutes and a little later this morning, John and I will be heading over to the college where they’re, apparently, having a heritage seed exchange. We don’t have any seeds to exchange but it will be interesting to see what’s available. It is definitely time to start thinking about the garden (too early to get out there as yet, but we can think about it).